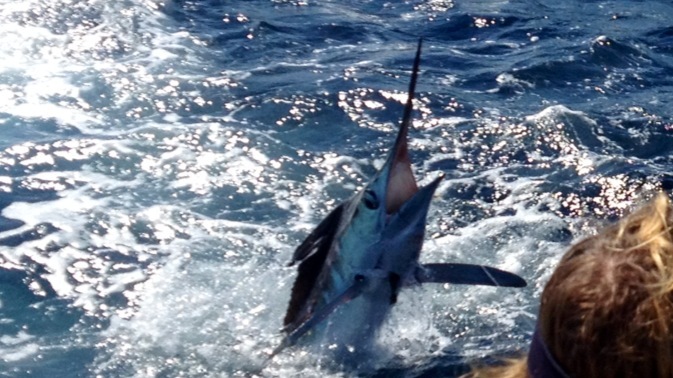 I ran the 27′ Contender “Trade In” with Maureen Klause, Cullen Wright, and Joe Carey in search of wahoo and white marlin. There has been a consistent bite of some wahoo and white marlin around the Hot Dog and the lumps outside of it to 50 fathoms. The ride there was a little rough, and the SW 15 knot wind kicked up the seas throughout the day, but we still fished. We started our morning at the Hot Dog and I was marking solid bait on the edge at 160 feet of water. We dropped a planar down with a blue/white Hawaiian Eye with a ballyhoo on wire behind it and WHAM! It was whacked within 10 minutes and up to the surface came a nice wahoo screaming out line and jumping all over the surface. 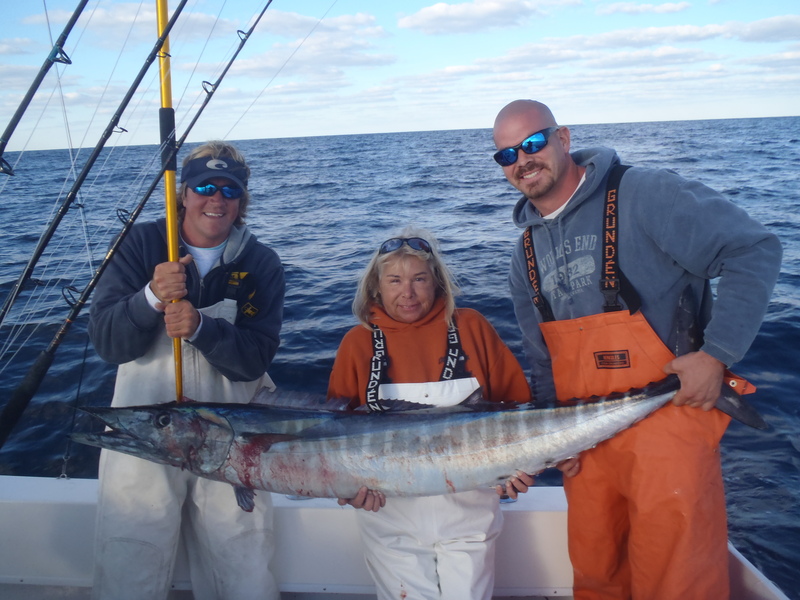 Maureen was on her first ever wahoo and after about 20 minutes of gaining line back, we had a nice 65-70 pound wahoo in the boat! We got back on the troll and went back over the same area and we hooked into another wahoo. 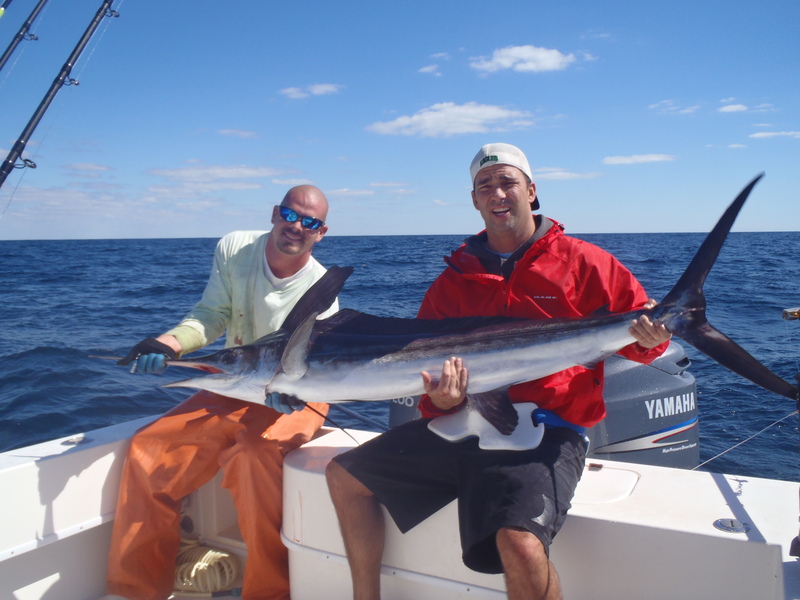 Cullen reeled this one in which was his first wahoo and in came another nice 40# wahoo. I worked the area a little longer but the bait disappeared and a friend was just offshore of me and had 2 white marlin already, so we pulled up the planer, put the dredge in and worked out. Once we got into 45 fathoms we started seeing the bait and put a nice gaffer dolphin in the boat. We were looking for a white for Joe since he had never caught one and after working the bait for a while, we had a white come up and hammer a bait. It took a screaming run and the white marlin made Joe work hard to get the release, but he stayed on it and we got a quick snapshot of him with his first white before the release. It was later in the day so we started working in towards the Tea Cup where I saw on the satellite shot that the same 73 degree water was, and it was on our heading for home. 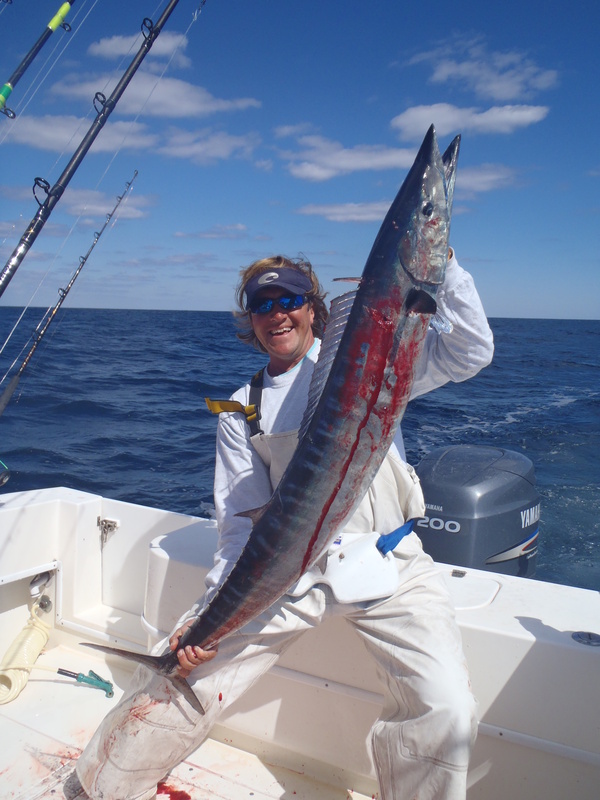 Once we got inside 40 fathoms we put the planar back down and we were on with our 3rd wahoo which I actually got to have fun with on the rod and reel. We put that 40 pounder in the boat and called it a day. Fun day of fishing and plenty of wahoo meat – my favorite! I mated again on the Boss Lady out of Avalon, NJ for an overnight trip. We left on Friday at 1 pm and made our way out in a 4-5 foot tight head sea towards the Lindenkohl Canyon. At 20 knots the 50′ East Bay ate up the seas well. We had about 2-3 hours before nightfall and trolled around the NE Corner of the Canyon. We managed to pick up 3 dolphin before we settled into our night chunking routine. As the night went on the seas calmed down a bit and made for a comfortable night. The water temps were holding steady around 73-74 degree, and it was green. Around 9:30 pm we had a 4 foot hammerhead come up and chase after a spot I had dangling from the outrigger. After a few missed attempts, the shark got ahold of it and was on for a minute before it chewed through the 60 pound fluorocarbon leader. That was it for the night as it was dead all night. We got on the troll at sunup and pushed into 50 fathoms inside the tip of the Lindy where a few boats were getting some tuna bites and we finally got hooked into one on a rainbow squid spreader bar. After a 20 minute battle, we sunk the gaff into a 60# tuna. We gave it another hour and then headed back to the dock as the SW winds kicked up and made for another bumpy ride home.